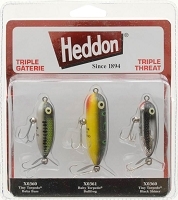 The Heddon Super Spook, Jr. is the mainstay of the topwater fishing market. Super Spook fishing lures features an internal rattle, super strong hardware and a very durable body construction. Super Spooks are great lures for bass, redfish and speckled trout fishing as well as peacock fishing. 1/2 oz. BooYah - Pigskin Jig - Molten Craw - 1/2 oz. BooYah - Pigskin Jig - Molting Craw - 3/8 oz.